You can make an alarm silent without disabling it. An alarm will show a pop up message without alarm sound when an alarm goes off. Click browse button for the alarm that you'd like to make it silent. Select the silence.wav file from selection window. Note this silencing method is not suitable for theft alarm. 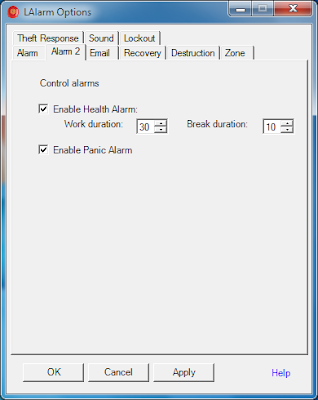 This new version introduces Panic Alarm. It helps protect the safety of the laptop user. In addition, some other user friendly enhancements have been added to this new version. Version 5.4 beta includes Panic Alarm, which alerts your emergency contact in case of an emergency. In addition, it emits a loud alarm sound to protect your safety. Other user friendly enhancement added to this new version. This new version introduces Health Alarm. It helps reduce health risks due to prolonged computer use and increase productivity. The version 5.3 also includes a user friendly help menu for the alarm message windows and the icon in the notification area. First enable the health alarm and then restart the computer. Just use your computer as you normally do. 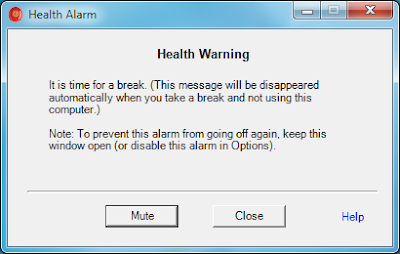 When you use your computer for a long time (50 minutes by the default setting) without a break, the health alarm will go off and show a health warning message on the screen like this. break away from the computer and do some simple eye exercises for a minute. do not use the computer until the health warning message is gone on the screen. This may relief on eye strain in your daily computer use. You may notice a difference as early as 24 hours from a trial. If you have chronic eye strain or repetitive stress injuries and still have to use a computer, you may adjust the Work Duration to 20 minutes from the 50 minutes default and gradually increase when it is suitable for you. You may do the same when you're setting up health alarm for your children. 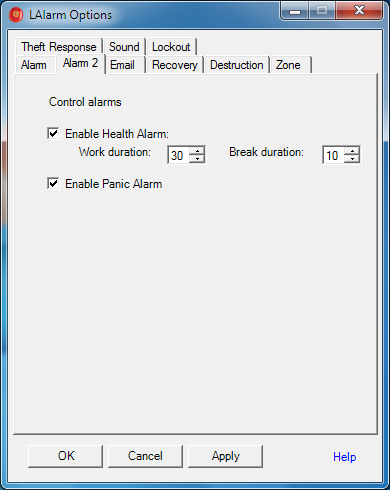 The duration of break is 10 minutes by the default setting, but you can also adjust it in the LAlarm Options. The health alarm will be running fully automatically without user intervention- no need to start or stop a timer. Even the warning message will automatically be appeared and disappeared accordingly without user intervention. It can help you develop a healthy computer habit. 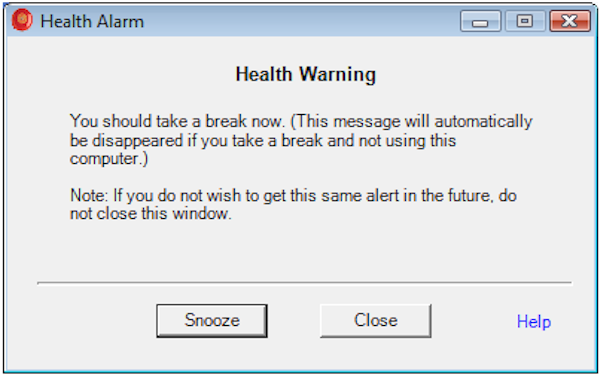 Once you develop a healthy computer habit, the health alarm will no longer show you any warning message. This tip is not intended to be a medical advice. This tip applies to LAlarm version 5.3 or later versions. Health alarm is designed to reduce health risks by alerting the user for using a computer for an extended period of time without any break. You can check for latest version of LAlarm from the LAlarm Options. In Options, click 'Help' and then 'Check the latest release'. The same can be done with the Help menu in the Setup program. When the theft alarm is ready to use, a LAlarm icon in the notification area. Another screen shot of the icon. It might take several minutes for the icon appear in the notification area in Windows Vista after a restarting. The load and speed of your computer will also affect how soon the icon might appear. In general, it takes less time on Windows 7 and even far less than on Windows XP. When you click on the icon, it will show a menu. This applies to LAlarm version 5.0 or later versions. LAlarm version 5.2 is easier to use and user-friendlier than previous versions. The installer and uninstaller have been simplified to make it easier to use. LAlarm version 5.1 is now available. Version 5.1 offers a performance improvement with the theft alarm. For example, it starts theft alarm sound quicker than previous versions when a USB flash drive is unplugged. It also provides an easy access to LAlarm Options. You can directly run LAlarm Options without having to run LAlarm Setup first. LAlarm version 5.1 RC (release candidate) is now available. Version 5.1 RC offers a performance improvement with the theft alarm. It starts theft alarm sound immediately upon unplugging a USB flash drive. It also provides an easy access to LAlarm Options. You can directly run LAlarm Options without having to run LAlarm Setup first.